While playing the top notch courses at Turning Stone in late July, I learned about an invasive species that apparently is the bane of diligent course groundskeepers: phragmites. Phragmites (Phragmites australis), or the common reed, comes in two subspecies. The native North American form is less dense, less robust and has a reddish stem. The invasive European version simply grows out of control, choking out native marsh plants, such as cattails. 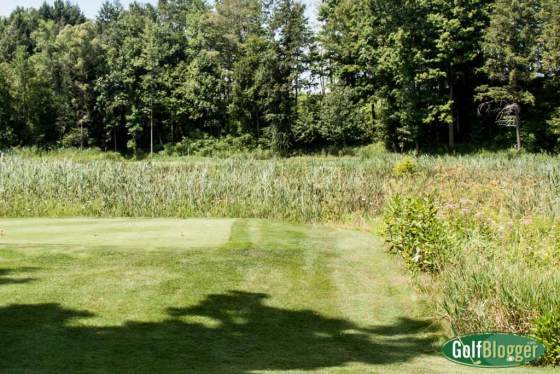 Turning Stone Golf’s Director of Golf and Grounds Matt Falvo said that the invasive phragmites are so aggressive that they will grow through cart path pavements. You can see the difference between the two species in a virtual pamphlet from Michigan State University’s Extension Service. From what Falvo said, the only real solution to the problem is mass extermination: application of some sort of herbicide or burning. That, however, requires hiring a firm that has the proper government licenses. Government agencies tend to be very sensitive about wetlands. The difficulty of extermination and government regulations probably means that only the most well-heeled and conscientious courses will be able to afford to restore native plants in an infested marsh area. Falvo apparently was planning all-out war to restore native plants to his courses. I played two rounds of golf at Turning Stone with Falvo, and found it fascinating to talk to him — to catch just a small glimpse of a course through through the eyes of the person responsible for keeping it in tip-top shape for the golfers.